Maharashtra smart ration card guide to apply online, download & required application forms in pdf. In case if you have any doubts related to maharashtra ration card do leave a comment here. Maharashtra State Government has recently started the initiative for a Smart Ration Card for all the consumers in the state. People are urged to get their normal, paper style ration cards converted into plasticised Smart Cards. In this article, we will be talking about the ways to apply for this smart card and its overall benefits on a normal, daily life basis compared to the usual paper style ration card. Also, we will discuss a few statistics of Maharashtra Ration Card as well. A Smart Ration Card is a ration card that any government allocates to its residents and consumers which is machine readable. A smart ration card is a step towards digitisation and it is helpful for both the consumers and the government alike in order to keep a real-time track of the commodities. Smart ration cards are the size of your regular debit or credit card, which can easily fit inside your wallet, because of its compact size and nature. The Smart ration card contains the beneficiary’s Full name, Address and the photograph of the head of the family. It has a barcode that has all the information including the details about the other members of the family as well. Depending on the requirement, you’ll have to either submit it there and note down the token or reference number. Or you will have to take a print out of that and visit the nearest Public Distribution System office of your district. You can download the form or take a copy of the offline form as well. Furthermore, you can keep it along with you for future reference. Besides, the whole process should take around 2-4 weeks to materialise. Consumers of the state of Maharashtra can easily track the status of their Smart Ration Card application easily. People who have applied for the same just need to have their Reference or Token number along with them while applying for the former. Note down the Reference or Token Number. Visit the nearest Public Distribution System office. Approach the Enquiry section of the office. Check the status of your application with the help of the clerk present there. The reference number is extremely important in order to progress ahead with the procedure. If not for that, it is nigh impossible to get to know more about your application. There are quite a few benefits if you possess the Maharashtra Smart Ration Card. The most important one, as mentioned above, is the compact nature of the card itself. The smaller in size card serves as quite a less of a hassle for all the consumers. The trouble with applying a new ration card or corrections is relatively less. The overall system is extremely convenient. The verification of documents is supremely easy now. People can avail the SMS Alert facility easily. 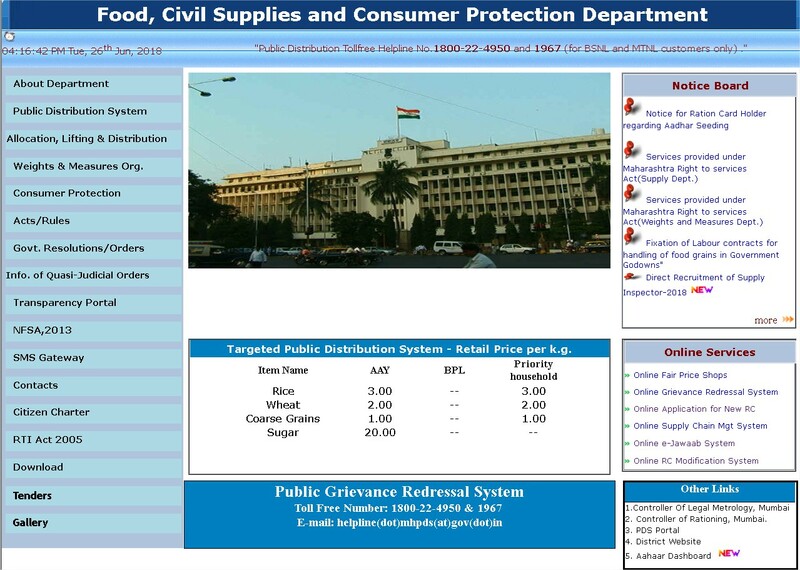 Consumers can easily check the status of their applied ration card. An incentive of Rs. 100/- for all BPL families. Will improve the work efficiency of the system drastically. Reduction of corruption on a monumental level. Expanding on the ones mentioned above, the most important aspect of the Maharashtra Smart Ration Card is that the card lets people get rid of several issues. The government has also mentioned that it will provide with a 100 Rupee incentive for all the BPL families who go for the Smart Ration Card. Apart from digitising the whole thing, it also helps the government keep track of the information regarding the commodities very easily. Above all, due to the easy transactions and authentications of the same, it is much much easier to keep a track on all the accounts and proceedings. All the mishandlings and corruption taking place will lessen to gigantic proportions. Quite a few documents are required in order to get this very thing accomplished. The documents are absolutely similar to that of a normal Ration card itself. It requires a certain bit of authentication to go with it. Since it is a matter of foodgrains and other commodities, governments will be very watchful on their part, at least on paper, so that the most threats of corruption, forgery and other fraudulent activities cease to exist. If you have any doubts do leave a comment here, we help you out.